GET TATTED UP FOR A GOOD CAUSE! This year, Cape Town is launching its first Tattoo-A-Thon Campaign in aid of a Cancer Charity Organization. CHOC (Childhood Cancer Foundation SA) is a nationwide organization aimed at holistic support for children suffering from various blood disorders. 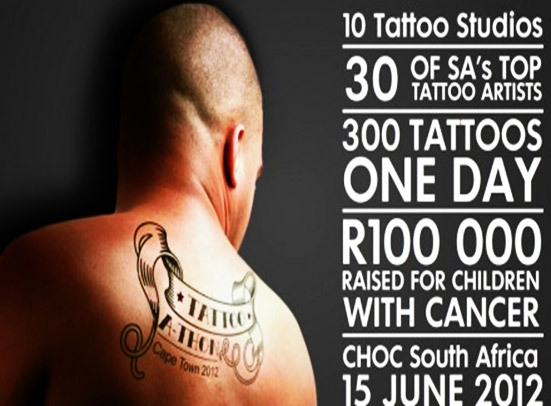 On June 15, the Tattoo-A-Thon is aiming at raising an estimated R100, 000. Ten of Cape Town’s top tattoo artists will be doing their thing; approximately 300 tattoos a day will be done. The event will draw diverse South Africans who are willing to express their share of a helping hand by getting inked! 10 tattoo studios will be made available to interested participants, so get ready to overcome your fear of pain if you are a first-timer. Skills from tattoo houses such as Wildfire Tattoos, Sins of Style, Metal Machine and Mob Inc will be ready on location to hook you up. A set price of R700 has been confirmed, as well as a set size. The CHOC Childhood Cancer Foundation was established in 1979 by a parent group in Johannesburg.